Is assisted living right for your parent? Yes…or maybe No. Yes! Today’s assisted living isn’t like the dreaded “old-folks home” of years ago. not every assisted living is the right match for you, your mom, her needs, and situation. What should you really be looking for and asking? Let’s look “under the hood” of assisted living. 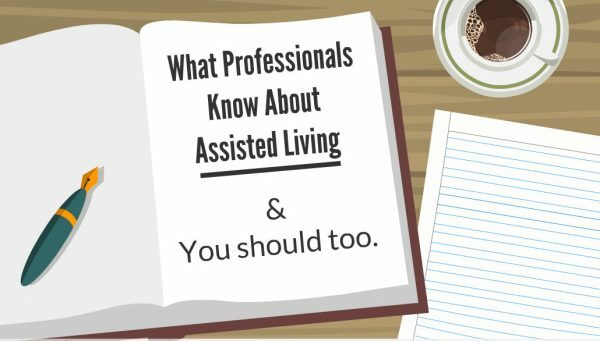 Let’s get clear about what assisted living is – and what it isn’t. Here are the 5 basics that professional referral agents know and that you should know too. You’ll often hear assisted living described as the “alternative to a nursing home.” This is only somewhat true. Assisted livings are not medical facilities. Assisted living is more like independent retirement. Both offer a “hotel-style” of living. But, assisted livings hire in-house staff to provide hands-on help with daily living. Think of assisted livings as a bridge. They span the gap between independent living and nursing homes that provide complex medical care. Older adults wanting to remain independent but get help when needed, choose assisted living. These residents can direct their own care, value autonomy, and like having choices. Assisted living facilities are licensed by the State Department of Human Services. They’re inspected every two years for compliance with Rules and Regulations. Inspection reports are public information. Every community must keep reports in a binder, on-site, and easily accessible. Don’t be shy. Ask to see it. In between inspections, any complaints of abuse or neglect are inspected within 24 hours. You can check Complaint Records online. Imagine a home or hotel. There is the floor and the ceiling. Some buildings have tall ceilings. In assisted living, the State sets the minimum requirements of care. That’s the floor or foundation. But each facility sets its own ceiling of care. Care assistance with bathing, dressing, personal hygiene, transfers, mobility, toileting, transportation arrangements, medication management, etc. Each facility determines how much care they’re able or willing to provide. Community “A” will assist or guide residents with transfers from bed to walker, if no lifting is needed. Community “B” will assist with transfers when 2 caregivers are needed, lifting is required, or a mechanical device is necessary. Community “A” will pass oral medications on a regular schedule. They’ll also provide regular diabetic glucose testing and give regular injections. But, they’ll require residents use pre-measured insulin pens. Community “B” will provide full sliding scale diabetic injection care. Also, a community’s “ceiling” can fluctuate. Fluctuations are based on overall acuity of care at any given time. For instance, a community typically providing sliding scale diabetic care, may, at times, decline any new diabetic applicants. The nurse or administrator may decide there’re too many current residents needing a lot of care. They want to ensure their ability to meet the needs of residents. Please note: there are many care tasks the State does not allow in assisted living. These care tasks are usually medical in nature and require licensed nursing. Residents in assisted living must be medically stable with predictable care. The State sets minimum requirements for care, but it doesn’t mandate staffing ratios. Each assisted living community is expected to staff according to the total acuity of care in the building. Caregivers in Oregon assisted livings aren’t required to be CNAs. Frontline caregivers or personal attendants are usually unlicensed but have passed criminal background checks. On-the-job training and regular monthly ongoing training is required. It’s important to understand that your mom or dad will share 1 caregiver with 13-20 other residents. The average staff to resident ratio is 1:15 (hopefully). Every assisted living community has its own “culture” or personality. The mix of residents, their backgrounds and interests, the current administrator, and team determine the culture. Before moving your parent to an assisted living, visit several times. Meet the staff, residents, and resident families. Attend events and social gatherings. Assisted living services continue to evolve. Many communities strive to meet today’s consumer expectations of choice, amenities, and aesthetics. Flexible dining and expanded menus are examples. But don’t be fooled. Lovely surroundings, fancy amenities, and extra services don’t always equate to five-star care. Work with a local referral professional. Make sure you find the right place for your mom or dad. Senior advisors have insider knowledge of a community’s history, staff turnover, compliance, and culture. They know the inside scoop. They’ve done the research, so you can relax through the journey. Part 2 covers the pros and cons of Adult Care Homes for older adults needing care. You’ll gain insight into specifics of care provided and the personality of residents best suited to care homes. Meet Carolyn and her dad, Bill. 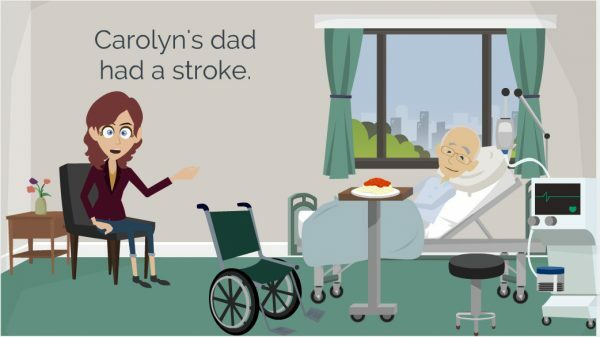 Carolyn’s dad, Bill, had a stroke and couldn’t live alone anymore. At first, Carolyn thought about bringing him home to live with her. But she soon realized how difficult caring for her dad would be: she didn’t have the physical strength to help with his transfers, her bathroom wasn’t accessible, and she would have to quit her job; Bill needed someone nearby around the clock. Carolyn felt bad. She felt she was letting her dad down because years ago her frail grandmother came to live with the family. Her dad and mom made sure grandma’s last years were surrounded by family. Carolyn’s dad always said that’s what he wanted someday if needed. Carolyn felt she wasn’t living up to the family’s expectations. Carolyn was racked with guilt. She stressed over thoughts of her dad having to stay in the nursing home. He hated it there and complained non-stop about the noise and food. Carolyn spent hours researching ways to remodel her home, find home care workers and estimating costs. She wanted to meet Bill’s expectations, get the best care for him and use his finances wisely. Carolyn met with a referral agency to discuss the options. They recommended an Adult Care Home because this care option matched Bill’s personality and care needs. Bill has developed close relationships with his caregivers and the other four residents in the home. In Adult Care Homes the caregivers live in the home with the residents. There aren’t shift workers coming in and out. His caregivers know and understand him because they care for him every day. They anticipate his needs and respond quickly to help with unscheduled care. Bill isn’t interested in bingo, bunco, and billiards. He prefers quiet conversations in small groups, reading his books or watching his programs. He likes sitting on the deck and watching others work the garden. It reminds him of his gardening days. Bill’s health care needs are significant but stable and predictable – his caregivers can manage his medical care. He’s confused at times because of the stroke but he’s not up at night or wandering. Carolyn feels relieved having her dad close-by, receiving competent, heartfelt care. She can stop by and visit him often, take him on outings or bring him to her home for family occasions. The funny thing is, Bill doesn’t usually want to stay at Carolyn’s house for long visits. He wants to “get back home,” he says. If you’re considering an adult care home for someone you love, here are some things to consider. Anyone moving to an adult care home must be medically stable; with blood pressure, pulse, temperature, and respiration in normal ranges for at least 72 hours. Infections must have been treated with antibiotics. Wounds should be dressed and follow up medical care scheduled. Diabetics must have blood sugars under control and predictable. Because care homes have a higher staff to resident ratio they can usually manage more complex medication management regimes. Also, staff can meet frequent “hands-on,” unscheduled care demands better than a larger facility. Care homes are best suited for people, like Bill, who don’t want to participate in lots of group activities. Because care homes are smaller and quieter settings, they’re sometimes unsuited for active, “social butterflies.” If someone would benefit from a robust activities program, then a larger community might be a better choice. The smaller environment of a care home means people needing close supervision are usually better served. Someone who isn’t safe, unattended, behind closed doors, for at least two hours, should consider an adult care home. The trade-off for closer supervision is smaller personal space: a bedroom versus an apartment in a larger community. Also, if a person isn’t reliable in recognizing they need help, doesn’t call appropriately for help and won’t wait for help to arrive, should consider an adult care home. Care homes are required to have a caregiver on premises at all times. However, a care home is family-style and caregivers need to sleep at night. They respond to infrequent calls for help and will often do a room check once during the night. Sometimes homes can manage frequent night care because there’s more than one caregiver and they take turns staying awake. But be aware, most homes can’t provide awake staff for frequent unscheduled caregiving. If your loved one absolutely needs frequent night-time assistance, be prepared for extra charges or consider a different type of care setting. Residents who act out, are combative, exit seeking or exhibit severe social behaviors, may not be a good fit for the smaller setting of a care home. Each situation should be evaluated on an individual basis. Contact a senior referral agent for help. Each home sets their own house rules regarding outside smoking areas, accepting resident pets and visiting hours. If your loved one has a pet they can’t part with, finding a care home will be challenging because most homes don’t accept resident pets. Most larger communities like assisted living do allow pets. Because care homes are smaller and more intimate, maintaining respect for all residents’ privacy is important. Older people tend to retire earlier so late visits should be avoided. Most homes ask families to avoid visiting at meal times because the residents tend to focus on visitors and not their meal. If you have an odd work schedule, a large extended family who frequently get-together or want to visit your loved one late into the evening, be sure to discuss these with the provider. Larger communities usually don’t have visiting hours. Adult care homes are the solution for a non-institutional, relational, family-style environment for care. Making sure a loved one receives personal and medical care in a home-like setting gives family’s peace of mind. It’s the next best option to bringing your loved one home to live with you. Referral agencies have previewed and pre-qualified the care homes in your neighborhood. Call an OSRAA member today for help.